The Chamber is hosting a seminar on October 16 to help investors and developers learn more about a new federal tax incentive that can benefit those with capital gains liabilities. 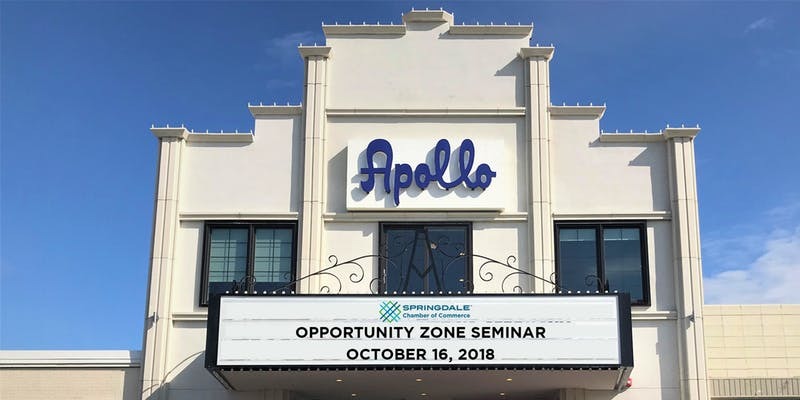 “Understanding Opportunity Zone Tax Incentives” is at The Apollo on Emma, Tuesday, October 16, from 9:00 – 11:00 a.m. Attorneys Kenneth Hall and Scott Lar of Quattlebaum, Grooms & Tull, will present and conduct a Q&A session. The seminar is complimentary to Chamber members. Registration is available online. Please use the code OZ18 to access the event page. Opportunity Zones are part of a new Congressionally-established tax incentive designed to spur long-term private sector investments. Springdale has four designated Opportunity Zones, including 100 percent of Downtown and a significant portion of our industrial parks. Our city is poised to benefit from the tax incentives available through this law. Read more here. Seminar attendees will learn how investors with capital gains tax liabilities may receive preferential tax treatment for investing in Opportunity Funds certified by the U.S. Treasury Department. Opportunity Funds use the capital invested to make equity investments in businesses and real estate in designated Opportunity Zones.